Want to Win a $50 Amazon Gift Card? 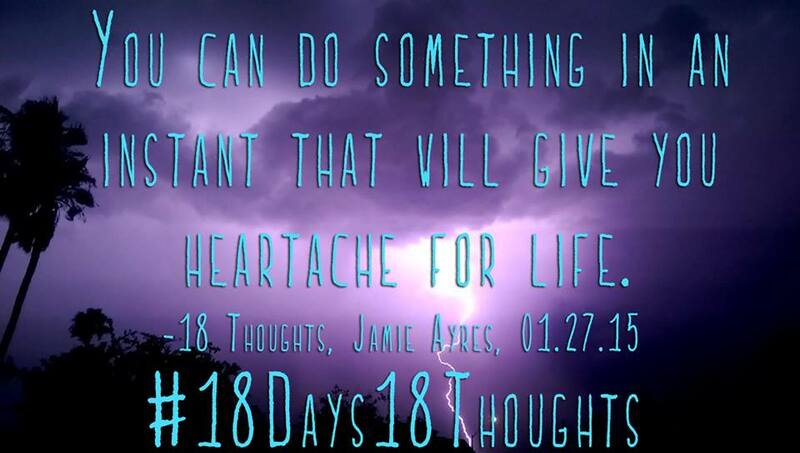 Share 18 Days of 18 Thoughts!!! 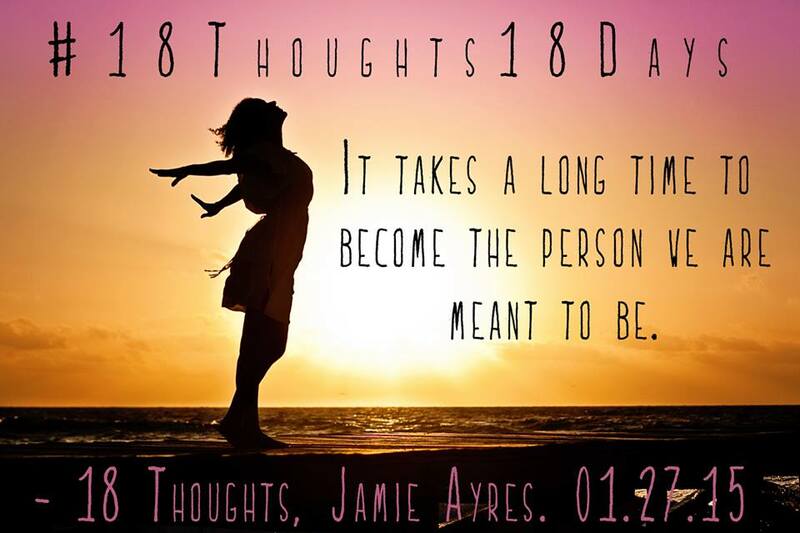 The conclusion of my Amazon bestselling YA coming-of-age inspirational paranormal romance My So Called Afterlife series is now just 18 days away, with the release of book three, 18 Thoughts, on January 27, 2015. 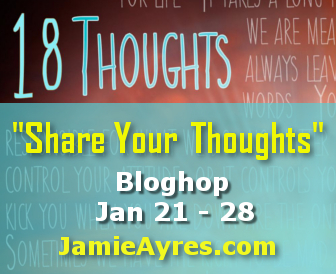 Additionally, they’re hosting a special Rafflecopter giveaway, where you could win a $50 Amazon gift card, simply by sharing one of the 18 Days of 18 Thoughts graphics and promo information over the next 18 days. You can visit their website for the rafflecopter & links to their social media platforms for your chance to enter every day!!! And that’s not all, nope, that’s not all! They’re also hosting a Goodreads giveaway, in which residents of the US and Canada can win one of 10 signed copies of 18 Thoughts! Please consider sharing to help get the word out. More exciting announcements/giveaways coming soooon!!! Ten hours until 2015 and counting!! And I have 2 things to celebrate. #1: My publisher, Curiosity Quills Press, is hosting a side-wide sale from January 1-3, with a whopping EIGHTY-SEVEN! titles discounted to just 99 cents! 18 Things is included in this sale, the first book in My So-Called Afterlife Trilogy. 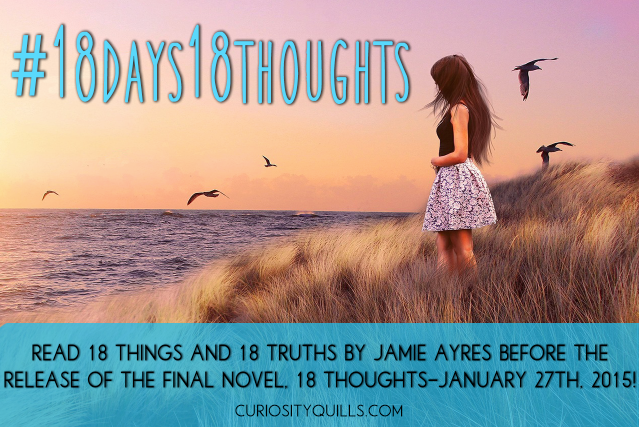 And with the last book, 18 Thoughts, releasing on January 27th, NOW is the perfect time to purchase and read if you haven’t already done so (I know some of you stubborn readers wait until a trilogy is completed before reading). Which leads me to #2 . . . the trailer for 18 Thoughts is here! Check it out and let me know what you think. I made it myself, and I mainly use it for my school visits. See you next Wednesday for the Insecure Writer’s Support Group post! Until then, I’ll be wearing my party hat because 2015 is going to be the B*E*S*T year yet! Have you ever had one of those days where you couldn’t get anything done because a hurtful situation was on instant replay in your mind? Maybe it was a bad review of your book or an emotional conversation with a friend or being treated unfairly at work or your kids not listening to you for the thousandth time. That was me today. 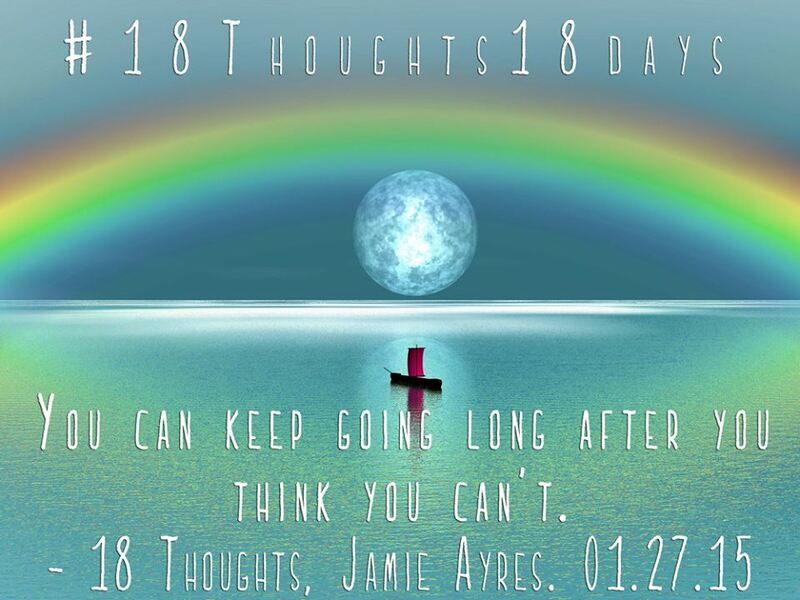 And with the release of 18 Thoughts, the final book in my 18 Things trilogy, coming in January, I thought today was good training. Because while I know plenty of people will LOVE the ending of my book, just as many could hate it. Knowing how to handle criticism is essential in life and especially if you want to last in the publishing business. My initial reaction to criticism is usually the need to tell my side of the story, to prove I’m right and they’re wrong. But this holiday season, as I listen to my favorite Christmas carol, Silent Night, it’s been a reminder to find a quiet place before I respond instead . . . whether it’s eating lunch in my classroom while listening to my iTunes, taking the dog around the block, reading a book in my bedroom, enjoying a relaxing bubble bath, playing around on Pinterest, or sitting quietly on my back porch. Why? Because in the quiet, things make more sense. Having some quiet time brings me to a more rational place where I can respond to the situation with truth. Because in the quiet, I’m able to put myself in the other person’s shoes and understand why they said what they did, even if I don’t agree with it. One thing I’ve learned over the years is even though multiple people are involved in the same situation, nobody sees things from the same perspective. So when we’re dealing with high emotions, whether it’s in a real relationship or with our book boyfriends, keep that in mind. Give your friend, coworker, family member, fellow author, or book reviewer the benefit of the doubt before you criticize them or respond to their criticism (and by the way, I’m a firm believer that you shouldn’t ever respond to a mean book review). With my next book release, I hope to stay ahead of the game by scheduling in some relaxation during the six week media blitz. Maybe if I pencil in some down time to relax and breathe, I’ll be able to respond with integrity when someone criticizes me because I’m not already pulling myself in a million different directions. And to celebrate the cover reveal for The December People Book Two, from December 1-21, Sharon’s Book One, Destruction, is on sale for 99 cents! 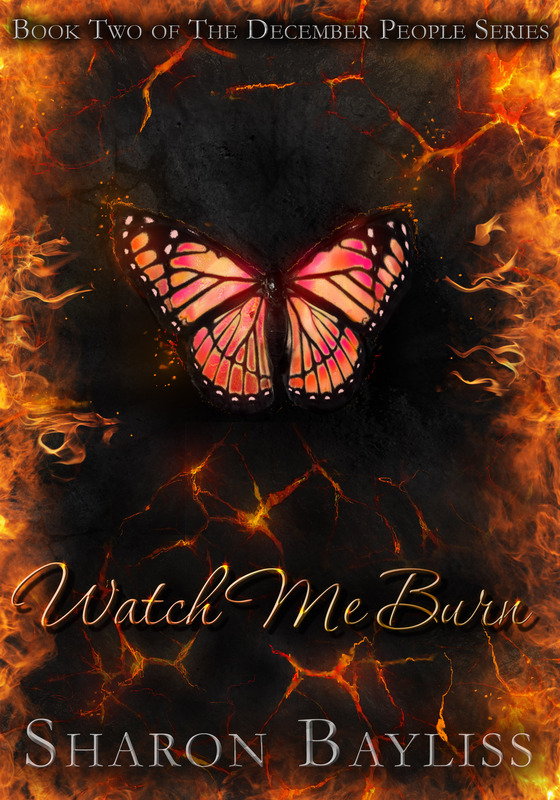 If you’re a fan of dark wizards and Urban-Fantasy, this is a MUST READ! Keeping his life together becomes harder when the new children claim to be dark wizards. David believes they use this fantasy to cope with their trauma. Until, David’s wife admits a secret of her own—she is a dark wizard too, as is David, and all of their children. Now, David must parent two hurting children from a dark world he doesn’t understand and keep his family from falling apart. All while dealing with the realization that everyone he loves, including himself, may be evil. Too Much Excitement for One Week! 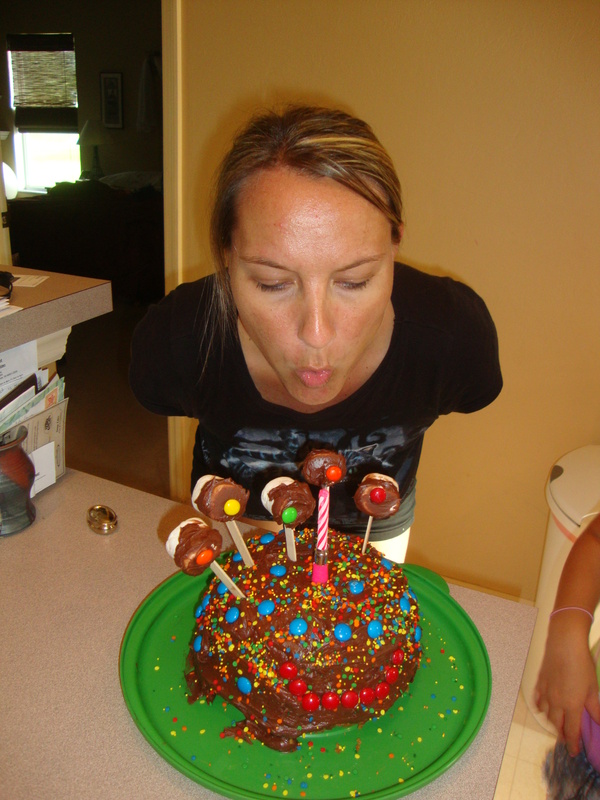 School starting, my first mother/daughter column, a national magazine book review, a 99 cent sale for 18 Things , and my birthday . . . everything is coming up roses this week 🙂 Let me tell you that there were many times I was severely depressed during my growing up years. My 14yo daughter started high school this week (at my old stomping ground where I met hubs when I was 14! ), and as he reminisced about those years with her, I realized I hardly remembered any of my own experiences. I think my subconscious just decided to shelter me by forgetting. But I do remember HOW I felt in my darkest hours, like each day would bring more troubles than I could deal with. So this week I’m incredible happy and thankful because as I’m turning thirty-five (which I view as the midway point in life . . . the Bible only promises us seventy years, eighty with a little trouble, so obey your parents! ), it dawned on me that my life is way more than I ever dreamed possible. I have two jobs I LOVE (teaching middle school writing & being an author), a husband who has stayed married to me for 16 years and counting even though I’m sure I got the better end of the deal, and two wonderful daughters. Speaking of which . . .
My teenage daughter has lowered her standards and agreed to do a weekly column with me on my publisher’s website. We’ll review movies, books, music, and fashion. You get both of our perspectives, the Jedi and the Padawan. 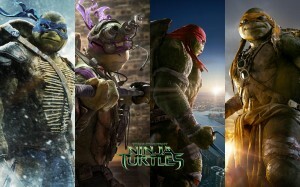 Check out our first post here, a review for the Ninja Turtles movie. 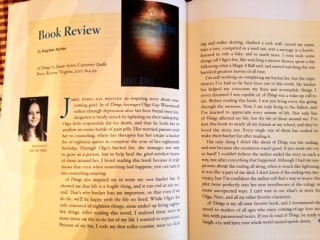 Also, 18 Things was reviewed in the Sept/Oct issue of Stone Soup magazine, written by my daughter! If you have a child 13yo or younger who loves to read, they may want to subscribe and/or submit to this magazine. As a book reviewer, they pay the child $40 and send them two free copies of the magazine. And in other 18 Things news, the Kindle ecopy will go on sale for only 99 cents tomorrow and Friday (regular price $4.99). I do hope you’ll download it if you haven’t done so already. And if you have, would you mind posting a tweet or Facebook status to help me spread the word? 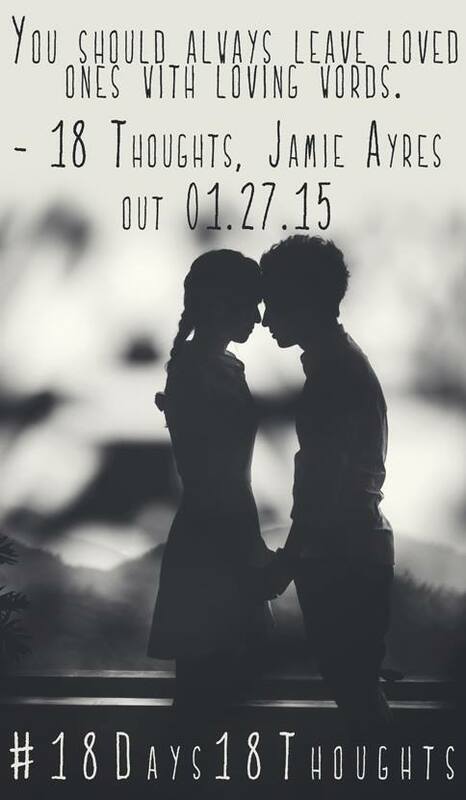 Last time it went on sale in February, it almost broke into the top 100 on all of Amazon (#114–sooo close!!!!). It’s on my bucket list to make it to the top 100, and it’d be about as sweet as it can get if I’m able to cross this one off during my birthday week! Will you help me have the Sweetest Birthday Ever?! 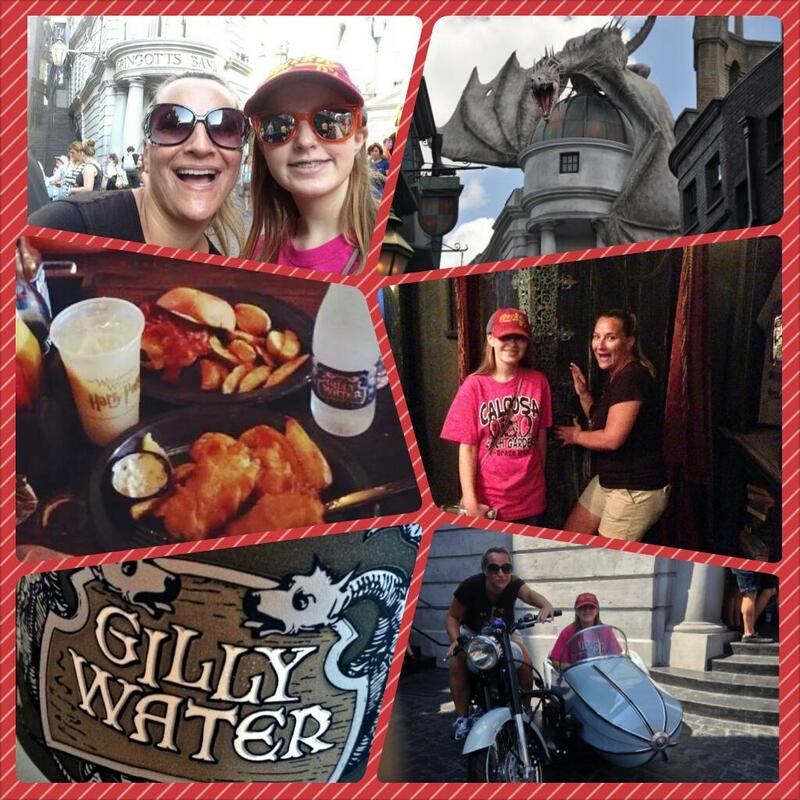 This past week, my fourteen-year-old daughter and I traveled to Orlando for LeakyCon, a fandom con birthed out of the Harry Potter book series, but has since branched out to include all things geek. We loved this con because they have a separate lit focus. I even got to moderate/present a Live Plot Twist panel with some of my fellow authors from Curiosity Quills (who has a newly launched website, so take a look)! 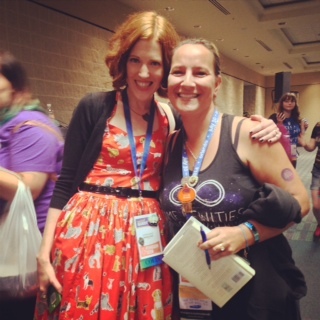 I also got to hear from YA bestselling authors like these . . . Some of the authors participated in a panel titled, “I Was a Teenage Writer.” We got to see and hear these top YA writers reading from some of their early–very early–works. 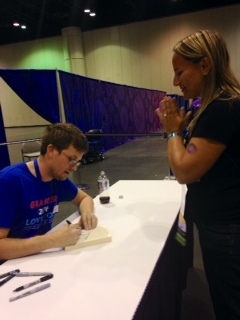 Here’s a clip of John Green reading aloud from his sample. I couldn’t film much because as you’ll hear, I was the Bozo laughing too hard and couldn’t hold her phone very still. The panel made me want to look at the first novel I wrote back in 2009, Sarah’s Crossroads, the one I thought was so perfect, I didn’t even need to edit it when finished! I submitted it to twenty agents and dreamed at night about receiving acceptance letters from all of them and wondering how I would choose to rep the million dollar deal I was sure to get!! Bahahaha! So, for your reading pleasure today, I present to you my prologue, with some bonus cliffnotes. The bolded comments are my thoughts while reading it today. And hey, don’t judge. We’ve all got to start somewhere 🙂 Hopefully it’ll encourage you. If I once started out with this piece of crap and landed a publishing deal for my 18 Things trilogy three years later, you can too! In the summer after I graduated high school I accidentally wrote the novel you’re now holding in your hands. (Accidentally? What the hell?!) I blame it on my college application to the University of Florida. Along with the application I had to write an essay. The assignment for the paper was this: Describe a setback that you faced. How did you resolve it? How did the outcome affect you? If something similar happened in the future, how would you react? Well, I graduated two weeks ago and have a lot of time to kill (you’ll find out why soon enough if you’re patient). (Oh yes, you’ll be rewarded soon enough, lol) So I decided to write this novel that I’ve come to think of as a simple narrative. I implore you to set this down right now if you’re looking for a tell-all scandalous story. Though it may seem like just that to my parents if they ever read it. But really it’s like a scrapbook of my life, mostly the lovely parts with Ethan, but also the secrets that you’d never mention at our family reunion. (But I’ll record it all in a book I hope gets published and sits on book store shelves across America!) In fact, at times it paints a kind of picture you’d want to burn in a bonfire at a church healing ceremony (that may sound strange to you, but they do that kind of thing at my charismatic house of praise). I guess it’s like a diary, a written chronicle as a keepsake to pass onto my future children. (This does sound like an assignment I’d give my middle school students . . . perhaps I was still in teacher mode when I wrote this?) I want to write it down now, before I’m too old to remember the stories I’d like them to learn from. I’ll openly admit at the start of this thing that I’m not an indifferent commentator and as I am just 18, haven’t yet had the luxury to be healed by time, but I’d also argue that what I’ve suffered through can’t be healed by the ticking of a clock. It’s difficult to forgive, let alone forget. And really, I don’t want to forget, not anymore. It’s what made me who I am today and if it hadn’t, I would’ve wasted my pain. Like they say, whatever doesn’t kill you makes you stronger. (I want to go back in time and kill this story before I waste two months writing it!) But to explain what I mean by all of this requires me to back up a little bit and tell you how it all began. It begins where many good stories begin (but not this one, because this story isn’t even close to being good). . . in a small town where girl meets boy. This has been a post for Alex J. Cavanaugh’s Insecure Writer’s Support Group, where we provide a safe haven for insecure writers of all kinds! Join us the first Wednesday of every month! And one more picture before I leave . . . daughter and I got to visit the Harry Potter expansion at Universal Studios on our LeakyCon trip. I wish I had a pensieve so I could relive that memory of walking into Diagon Alley and taking the Hogwarts Express over to Hogsmeade for the first time. So A*M*A*Z*I*N*G!!! I’m a firm believer that if we don’t have a big dream we’re striving toward, then we’re just kind of drifting through life. That’s why I made a bucket list back in 2008 when my cousin’s son was diagnosed with cancer. That’s why I put publishing a novel at the top of that list. And that’s why I started working toward that goal in the summer of 2009. Five years later, I have two novels published by Curiosity Quills, a small press, with the last installment of my 18 Things trilogy due in January 2015. I thought waiting for it to happen would be the hardest part. If I could’ve put my dream in a microwave and made it happen in 30 seconds, I would have. But that’s not how most dreams work. Like most writers, I endured lots of discouragement while agents, editors, and even friends and family members told me it wasn’t going to happen. They weren’t mean about it. They all thought they knew best. But it wasn’t their opinion that mattered to me the most. I’m the one who has to live with my decisions when I lay my head on the pillow at night. If I gave up, what kind of example would that be to my kids and the students I teach every day, who I tell every day, DON’T GIVE UP! THAT VICTORY YOU NEED IS JUST RIGHT AROUND THE CORNER! *shakes pom poms* Sure, I had my doubts from time to time, but I learned to tune out the haters. 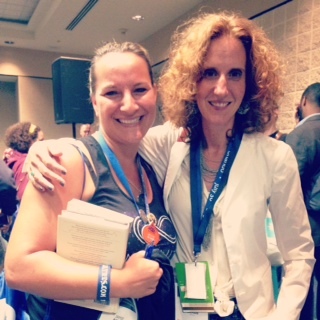 I knew the path to publishing wasn’t paved with rainbows, unicorns, and puppies. I also knew God would make it happen when the time was right. And he did! But then I discovered I was wrong (happens occasionally–hahaha). The hardest part wasn’t the 3 years I waited to get a publishing contract, the hardest part has been trying to juggle my teaching job, my writing career, being a wife to three needy children (yes, I counted my hubs as a child, lol–LOVE him though), volunteering at church, bible study and book club, cleaning and cooking (oh, who am I kidding?). Here’s another thing I firmly believe: EVERYTHING you have is a gift from God, including your talents and abilities. And why would God give us these things if he didn’t want us to use them for his glory? There’s a moment of truth where she swings out to catch the bar that’s swinging toward her. But in order to reach the bar, she has to let go of the one she is swinging on. If she doesn’t let go, she just swings back to where she started. But if she lets go, there’s a split second in time where she’s hanging in mid-air, thirty feet above the ground, and holding onto absolutely nothing. That’s what faith looks like. Is giving up my dreams of being a professional author a lack of faith, or an act of obedience as I commit more time to my family? What’s more important? Faith or obedience?